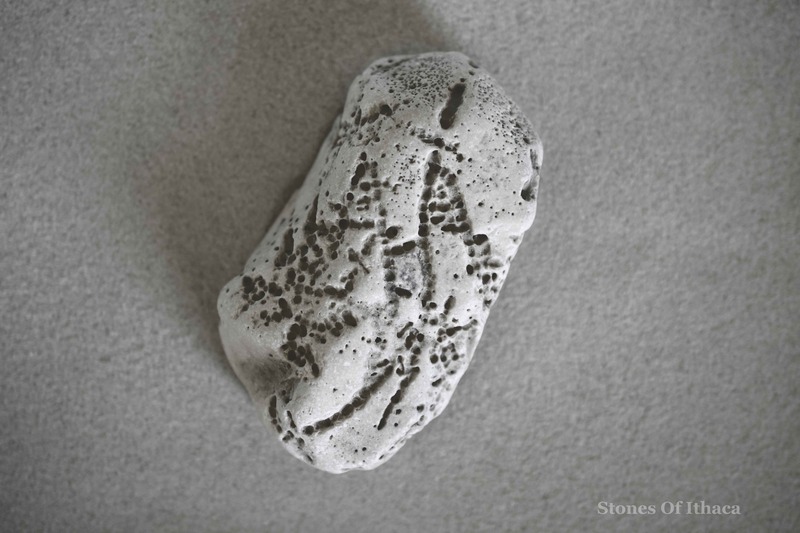 On this stone found on the beaches of Ithaca, we can see twin peaks, perhaps with snow on them, and a path running in between, a path that seems to want to invite us to take it and to progress to the field beyond. There is a larger figure overshadowing the right of the peaks, swaying in the wind, perhaps unstable, bending to the contours of the landscape. We must remember that these drawings are done by stones or else planted on them by external forces. Meanwhile, in language, there is a striking parallel between the words “planet” (which itself is a derivation of “plant”, which itself is a derivation of “land”, and so on) and “template”. A template is a model, something we can use to make our own creation, but it is not the finished version. Is there a chance that this planet spinning in space in a cul-de-sac of the universe is a template for us to learn to live our lives, to learn values, to learn cohabitation, to learn humility, certainly, and also joy? If this is so, planet-template, then that should make us re-evaluate our position on this planet and place it in a wider context. Because once the template has been saved and closed, the “Undo” function becomes unavailable. While the environment and protecting the environment are important, so is caring for our souls. The earth is like a heart, says my wife, with rock and fire, but around this, enclosing this, is a thin layer, a surface of soil that feeds us. Earth-heart, soil-soul.